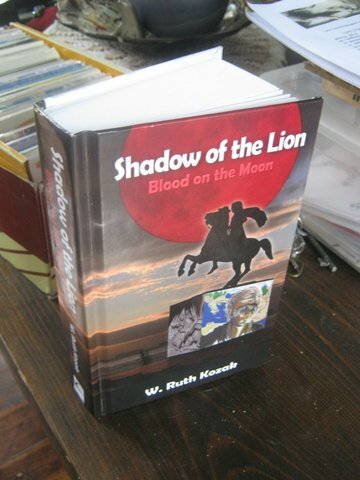 It’s my great pleasure to welcome, Ruth Kozak, author of the historical fiction novel, Shadow of the Lion: Blood on the Moon. W. Ruth Kozak is a Canadian travel journalist with a strong interest in history and archaeology. 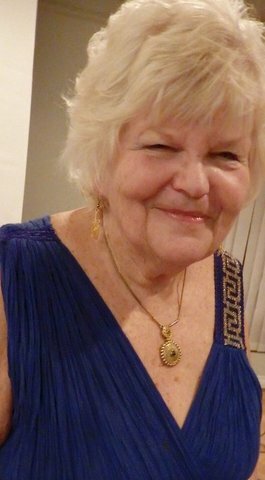 A frequent traveller, and a published travel writer since 1982, Ruth lived for several years in Greece and instructs classes in travel journalism and creative writing. Ruth also edits and publishes her own on-line travel zine at http://www.travelthruhistory.com She has been published in the APA Insight Guides 1994, Writer’s Abroad anthology “Foreign Flavours”, as well as two poetry anthologies, and was writer for The Vancouver Guide for Planet Eye Traveler. She recently worked on an Athens Guide e-book for Hunter Publishing, US. SHADOW OF THE LION: BLOOD ON THE MOON is historical fiction. Though ‘fiction’, it is based on a historical time-line so the events in the story are true. Most of the characters are historical with a couple of fictional characters thrown in for a balance. After the death of Alexander the Great in Babylon, 323 BCE, his generals begin to squabble over who should take control. A son is born to Alexander’s Soghdian wife, Roxana, a month after his death – Alexander’s only legal heir. But as many of the generals do not want a non-Macedonian ruling, they name the child joint-king along with Alexander’s mentally deficient brother, Arridaios. The theme of the story is “How blind ambition and greed brought down a world power.” Volume One , Blood on the Moon, follows the journey of the two joint-kings from Babylon to Macedon. Volume Two (to be published in 2016) The Fields of Hades, is the account of the wars of the Successors, and the women who were powerful figures in Macedonia including Alexander’s mother Olympias and 18-year old niece, Adeia-Eurydike. It was a challenge finding sub-titles to suit the book. The main title, SHADOW OF THE LION, was chosen because everyone in the story is living under Alexander’s shadow. He symbolizes a lion and often wore a lion’s head helmet. When the publisher decided to break the very long novel into two parts, I then had to find a suitable subtitle for each Volume. The end of Chapter One has a scene where two suspects in Alexander’s untimely death are seen leaving Babylon. As the sun sets and a reddish moon rises, the youngest man notices and says, “Look! There’s blood on the moon. Surely it marks our destiny!” Hence the subtitle ‘BLOOD ON THE MOON’. For Volume Two, because it deals with all the battles and the results are a true Greek tragedy, I chose the title THE FIELDS OF HADES. I became interested in Alexander when I was a 16-year old in high school. In my last year of school I wrote an Alexander-themed novel. I’d always wanted to write a novel about my hero, but Mary Renault had done a good job with her Alexander trilogy. So I decided I’d write about Alexander’s little-known son, Alexander IV (called by his Persian name “Iskander” in the novel). I was going to write it as a young adult story but found it was far too political. So I was advised to rethink it and start over. Once I established the theme I knew what to do, and started again in multiple points of view. The boy is still an important character in it but you get all sides of the story. Alexander is a ‘golden thread’ woven throughout the tapestry. Mary Renault’s “Funeral Games” had disappointed me, being her last and a quickly written story, and this is the same era I’m writing about. I wanted to develop the characters and really give this tragic story some clout. In doing so, I paid attention to developing the characters, visited as many of the sites that I could get to, and lived in Greece for part of the time while I wrote it. I love the research, although I have to rein myself in! And I love it once I have a grip on the characters and can let them ‘tell’ me their own stories. I also enjoyed exploring the actual locations for much of this story. Getting facts straight, in the case of this novel, which is mainly a ‘true’ story. My current work-in-process is a Celtic/Greek tale and purely fiction other than a couple of historical characters (young Alexander). I’m finding it much harder to write because I have to make it logical and realistic. SHADOW was easier as I was following a historical plot-line. I was very meticulous in my research to get the facts straight as there is always someone to call you on it if you ‘make things up’. Because of my detailed research, it took me 15 years to write the complete book (which is now the two volumes). Mary Renault, Steven Pressfield, Margaret George, and many of the Classics writers. I am also reading an amazing book by Louis de Berniere and I admire his writing style and research skills. Mary Renault was my writing ‘mentor’ in that I have read her books over and over. I also found Margaret George’s books inspiring and Steven Pressfield’s Greek-themed books. Three writers, who I mention in my book forward, who were so supportive of me in the writing of SHADOW. Steven Pressfield has always been very supportive of my work. Writer Scott Oden and I have kept in touch and supported each other’s writing all along. Dr Jack Dempsey, author of “Ariadne’s Brother”, an amazing book I read back in the ‘90’s, has been a mentor since I first contacted him after reading his book. I couldn’t have gotten this massive project off the ground without the help of the Greek Consulate of Vancouver. When they learned what I was planning to write, back in 1991, they flew me to Greece to do more research. While there I was given interviews at the Ministry of Culture and Society of Macedonian Studies. I was also granted permission to research at the British Library and Gennadius Library in Athens. The Finnish Institute in Athens provided me with a site pass so I could visit any archaeological site for free. I met many Classical scholars there who also helped me. Last September, when I was promoting my book in Greece, I was invited to do a reading at the Athens Centre to present my book at a World Poetry Conference in Larissa, and I read to two grade 9 classes at the Athens Community School. And when it came time for my book launch, the Consul of Greece in Vancouver, Ilias Kremmydas, sponsored it at the Hellenic Centre. I owe a lot to the Greeks! I also belong to an amazing critique group, The Scribblers, and several of them were in on the very beginnings of this novel. They have been a tremendous help, and with their experts critiques and encouragement, I was able to keep going for the long, long journey that the book took me on. I have my bedroom set up as my writing space with pictures on the walls and little sayings to inspire me. When I am working on a new piece I often go for long walks and make notes in my notebook as I meditate and the words start flowing. I usually write scenes out long-hand before transferring them to the computer. I guess it’s my age, which I tend to ignore (because most people think I am much younger). I was 80 when I finally got my first novel SHADOW published! I had a play produced successfully in 2000 that I had originally written in 1953 and reworked. You have to be tenacious, patient, thick-skinned, and also organized. It took a year before I hit ‘bingo’ and that was just by chance. On a last minute whim before leaving for another Greek holiday, I sent out the query to MediaAria-CDM. They immediately responded and within a few weeks said they wanted to publish. It happened the publisher loves that history! I have also just learned that no matter how many times you and your publisher and your editor go through the MSS, there are likely going to be typos. Ach! I couldn’t believe it. Though many were easily missed in the spell-check. I spent money on a very good editor. I workshopped my novel from the beginning in my very excellent critique group, and before I sent it to the editor, I had two friends read through the original (1700 page MSS) to help me decide what to cut. My publisher remarked on what a good editor I had. It cost me a lot (and should have cost more) but it was worth it! First, find a good editor. Don’t give up. Eventually you will find the right home for your book. I didn’t want to self-publish SHADOW because of its contents and the work I’d put into it. But these days lots of people do. However if you choose to self-publish, pay attention to all the above–get a good editor first! And be prepared to do a lot of work once the book is published as well. Athough SHADOW was published traditionally, I still have to promote and find myself working on this almost every day. But it’s worth it in the end. My website www.ruthkozak.com will link you with my blogs and other sites, including the on-line travel ‘zine that I edit and publish. SHADOW OF THE LION: BLOOD ON THE MOON is available through Amazon.com and can be ordered at major bookstores such as Chapters and Barnes & Nobel or any high-street book stores in UK. Even smaller bookstores will order it for you. Hopefully it will soon be on bookstores shelves. It is already available in the libraries in Vancouver area. I am currently working on a Celtic tale “DRAGONS IN THE SKY” told partly in Bardic verse, linking the Celts of the 3rd C BCE to the Greeks, and introducing Alexander as a youth who rescues my Celtic Druid’s child from her kidnapper. It is a sort of past-life regression story told in first person, so somewhat tricky to write. My writer’s group loves it! Now I just have to finish it. Still working on the first draft and have been for ages, as I set it aside a long time ago when I decided to write SHADOW, thinking the Young Adult story I’d planned would only take a year to write. LOL! I also write travel stories for a couple of on-line sites, www.EuropeUpClose.com and www.travelgeneration.com as well as any others who like my stories. I teach travel journalism and creative writing classes, workshops, 3 morning memoir writing groups, and some one-on-one writing coaching. I’m currently president of the BC Assoc. of Travel Writers. Thank you for a great interview, Ruth. I wish you all the best with your writing and your many projects! A great interview. Ruth is an amazing person and an inspiration to many of us. Hi Darlene, Thanks for your visit. I can see why Ruth is an inspiration to many, she is amazing! Previous Previous post: What Does Compassion Mean to YOU?